Whilst there are very few colours that can’t be worn in some variant by every skin tone, the brown we refer to as chocolate has generally warm values. Don’t you find that just saying the word makes you feel very slightly warmer inside? Mmmm, chocolate! See..? Cooler skintones can wear pinker, chalkier shades of brown however, and just like the perfect selection box, there really is a colour to suit everyone. 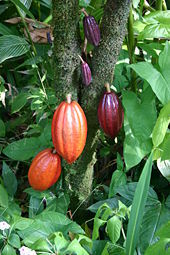 Cocoa pods on the tree. Look at all the different shades here! Of course chocolate itself can range from the darkest of shades of bitter, dark pure chocolate, which is actually darker in colour from the raw cacao nibs from which is it extracted, almost black in many lights. People with warm skintones can wear this shade instead of black as it is far more flattering against the face, having undertones of gold deep within it. And white chocolate at the opposite extreme is a warm creamy tint, white with a hint of vanilla or spice… all of which can be mixed and matched together with other hues in fashion or interiors for a sophisticated and subtle look. More typically when we talk of chocolate brown as a colour we are referring to something that visually resembles milk chocolate, a slightly paler but still rich and warm colour. It’s the colour of the earth and as such wearing it,eating it or surrounding ourselves with brown helps us to connect with nature and all things natural,bringing a sense of security and stability. It’s a colour that seems to flow viscously and comfortingly, the way melting chocolate drips and flows elegantly to create the gorgeous confections I had to stop and buy when in London recently. The colour of a steaming cup of hot chocolate – the real-deal cuddle-in-a-cup cocoa-rich stuff, not the horrible adulterated ‘Cola Cao’ the kids drink here in Spain… as though chocolate needs sweetness adding! In fact chocolate contains everything it needs already, it is complete and well rounded, no wonder it is regarded as a rediscovered superfood. The antioxidant activity of dark chocolate and cocoa powder is equivalent to or higher than that found in acai berry, blueberry, cranberry, and pomegranate – even though these are all gorgeous anti- aging colours too! Because chocolate brown is a neutral shade and always classic it can be used as a basic foundation to build a unique look upon. Chocolate is a treat and as such you should have it how you want it! Chocolate brown is also a great colour for accessories, as it has a timelessness about it that transcends fashion, and goes with many different looks and styles – you can warm it up or cool it down to suit your natural colouring. Just think about how many different colours and embellishments a good chocolatier can use to create gorgeous confections and fillings. My hot pink coat would make a delicious soft centre! Pink is un-conditional love, a feminine, affectionate colour and shares the soothing comfort factor of brown. Fondant fruity fillings tend to be associated with the big tins we exchange at the up coming festive season, in their jewel-like individual wrappers. What will you wear using your adaptable browns as the backdrop for your yummy colours? Pass the tin over here, I’m going for the strawberry pink one !! What’s your favourite?